Zon Huntreas is a well renowned Starfleet officer and Federation diplomat, known chiefly as the Captain of the U.S.S. Explorer. Zon enrolled in Starfleet as an engineer and an explorer, serving on the Excelsior-class U.S.S. Agamemnon for most his career, eventually being promoted to Chief Engineer. In 2374, his ship was attacked by the Dominion, and the attack left him the only senior officer on what was left of the bridge. He assumed command, and was later transferred over to the command track, having done well- -and with the casualties suffered during the war, capable commanders were in short supply. He recieved a promotion, and took the position of First Officer onboard the starship. He was later awarded a Purple Heart (with galactic swirl) for his bravery during the Chin'toka Retreat in 2375, where the Breen disabled and destroyed the Agamemnon, along with Captain Sisko's Defiant and hundreds of other Starfleet ships. However, he had refused to abandon ship, and ensured that his crew had gotten out safely, save for the captain, who had been killed in the attack. He was then given a second battlefield promotion in as many years, and given the captaincy of the Intrepid-class U.S.S. Explorer, quickly bringing most of the surviving Agamemnon crew onboard. Though some had misgivings due to his young age, he took the ship and battled with valor, recieving a commendation during the Advance on Cardassia that ended the war at the end of the year. Since the end of the Dominion War, the Explorer had been involved in a variety of interstellar mapping missions, and colony transport. With the return of one of the Explorer's sister ships, the lost U.S.S. Voyager, in 2377, Starfleet began an experimental testbed program to utilize the advanced propulsion data technologies that the Voyager had encountered, observed, engineered, theorized, or captured. In 2379 the Explorer was selected as the first starship to recieve a 'field test' of the Quantum Slipstream Drive, and for most of 2381 Zon and his crew had labored dilligently in order to modify the ship and balance the theories in order to produce a working drive. Though initial tests had no problem transitioning the ship into the Slipstream threshold, the hull stresses involved proved too much for any ship to handle. However, with advanced SIF and Deflector control algorythms and technology developed during the war, the Explorer was given a green light to begin a five-to-seven year mission of exploration on the edge of known Federation space. However, due to the discovery of a kind of hyperspatial transporter 'ring' known as the "StarGate" on Earth, with a portal connected to a planet near the Romulan Neutral Zone, the Explorer was diverted from it's intended path to the Delnevorian star system to investigate the StarGate from the other side. In arriving at the system, the Explorer was enveloped in a type of Trans-Galactic highway that led over 20,000,000 light years to a binary star system in another galaxy known as the Tatoo System. After discovering that the route between the two galaxies was stable, and that evidence suggested there would be more, Starfleet Command ordered Zon to use the Explorer and it's Quantum Slipstream Drive to facilitate safe and peaceful contact between the two galaxies, and to explore this new frontier. Furthering research into this new frontier, Zon and the crew of the Explorer made first contact with the benevolent, galaxy spanning democracy known as The New Republic, leading to a new era in intergalactic cooperation. Under Zon's guidance, they also conducted several high level scans and experiments reguarding the Trans-Galactic Highway, which was now coined by the locals as the "Route of the Ages." It was Zon's ship that was the first Federation starship to discover that the route's endpoint in the Tatoo system was a kind of interdimensional hub, fed off of some unique properties that existed around the system, and that while the Tatoo Route would lead to a hundred other galaxies, the Delnevorian route only seemed to lead to the Tatoo system. Likewise, the Route needed a specific tachyon pulse to control which galaxy the ship was taken to; the crew of the Explorer pioneered the modifications on Starfleet starships needed to navigate the route. Even more stunning was the way the Route's unique radiation seemed to interface with the Explorer's computer systems. In fact, their first trip through the Route inadvertantly caused a holoprogram based on the records of an ancient submarine known as Seaquest to gain sentience, giving birth to two young teens, Katheryn and Lucas Wolenczak. These two would cement Zon, already known to the plight of photonic life forms, as a hardline proponent of holographic rights. Later in the year a group of powerful beings, claiming to be from a solar system hidden inside the Route, stole one of the stars from the Tatoo system. While Zon was careful during first contact with these incredibly powerful machine beings, he eventually was able to travel to their home system and negotiate a treaty which allowed them to rebuild and repair the Tatoo stars and appologise for their actions, at the behest that the coordinates to the pocket dimension were erased from the ship's databanks. True to his word, Zon erased the data. The Explorer was also first Federation starship to come in contact with the violent, genocidal machine race known as the Cylons, which resulted in a pitched battle which left the starship damaged. After returning to the Alpha Quadrent for repairs, and rearmament, the crew of the Explorer recieved new orders: to investigate the Cylon threat, and negoatiate treaties for colonization on the other side of the Route of the Ages. The crew was present at the beginning of the historical "Treaty of Naboo," which ensured peace between the Federation and the New Republic, along with giving the Federation a 30-system bredth in the Outer Rim known as the Federation Expansion. However, the Explorer was unable to make the actual treaty signing due to the shadow cast by a new threat: The Goa'uld. Later on in the year, it would be Zon who would finally discover the truth about the Stargate Network, during an exploratory mission on a planet which contained a Library of Knowledge of the race that built the Stargates. This library imbedded itself into the Captain's brain and began to rerecord over it, giving Zon the knowledge of the Ancients at the cost of eventually killing him. Zon was thankfully able to contact another race, known as the Asgard, in order to undo the damage and remove the knowledge, but not before he was able to provide Starfleet Command with over a thousand stargate addresses. Zon was an established explorer, and captained the Explorer through several unique first contact situations. He helped to bring Tragolite Federation officials on a visit to Earth, as well as visiting their space station in order to uncover important information about the Slaw during the Slaw Conflict. Zon was also present at the Imperial/New Republic goodwill reception, though he clashed somewhat with Dakkon Kael. During this time, Zon cautioned against giving into any of the demands made Anuke, a Goa'uld princess he had captured. Starfleet was eager to learn about the Goa'uld, however, leading to her escape. She would later come to Zon, after being deposed from Tatooine, to ask for Federation Amnysty. Zon again cautioned against treating her as anything but a dangerous prisoner, and the Explorer ended up being on the strike force that went against Anuke's captured Starfleet forces. During this final conflict, Zon utilized a near-warp transport in order to get inside Anuke's escape shuttle and return her to the brig of the Explorer, where she was later taken by Starfleet Intelligence, and at Zon's insistance, jailed on a small research colony in the Federation Expansion. The Goa'uld system lord known as Ra later attacked this colony, massacring the inhabitants. This attack left a profound effect on Zon's consciousness, cementing in him the evil of the Goa'uld. Zon continued to serve as the Captain of one of Starfleet's most prolific vessels, and gained a kind of celebrity due to his status as the first full-time extra-galactic explorer throughout the history of the Federation. However, in late 2382 the Explorer was destroyed by a Goa'uld sleeper agent, and while Zon and the majority of the crew were able to escape without harm, the damage to his reputation had been done. Somewhat blacklisted among Starfleet despite his status, Zon served on the front line of the Stargate Exploration Program for several months. He assisted his ex-XO, James Blackwell, when Blackwell was part of the investigation team which made first contact with the semi-sentient race known only as the "arachnids,' which had overrun a Federation colony. However, in June of 2383 he and other ex-Explorer members seemed to leave Starfleet and begin a small paramilitary terrorist organization dedicated to attacking high level Starfleet Admirals. However, with the help of Lucas Wolenczak and other friends that Zon had made during his adventures in the other galaxy, it was revealed to the Federation public that several high ranking officials had been involved in a conspiracy which dealt with an series of parasitic organisms that had been controlling Starfleet deployal rates for the last year. Due to his experience in fighting the Goa'uld, Zon was able to recognize this threat, and with Lucas' help primarily, neutralize the mother creature. With their names cleared and bravery proven, Zon and the other crewmembers found themselves open to any posting in Starfleet that they may have fancied. When Zon was offered the command of a newly comissioned, Galaxy-class U.S.S. Explorer, he jumped at the chance, the majority of his Senior Staff resumed their posts, save for James Blackwell who was promoted to Captain the new, Defiant-class Agamemnon, and Ensign Miranda Ramierez, who was promoted to Lieutenant and given a new position at Ops. Commander T'mlik took on as First Officer as well as Chief Science Officer. One of the new Explorer's first missions was to conduct a full scientific investigate on the Route of the Ages, which Zon took to with great zeal. However, it was during this incident that the Goa'uld-Peacekeeper War spilled over into the Outer Rim territories, and Zon found himself assisting Haweke Karbn during the events that led the latter to be 'twinned' into two identical pilots. Zon was put in the all too familiar situation of needing to contact the Asgard in order to help remove the Ancient Repository of Knowledge from one of the Haweke's brain. Eventually Haweke was 'cured' due to a rather serendipitous holodeck malfunction, and he left Zon with a large number of Ancient equations in the ship's databanks. Only weeks later, the Explorer was involved in a galactic chase when Angel Carlson, a young, genetically and spiritually engineered teenage girl from Tatooine, was revealed to be the human host and avatar for the cosmically-powerful Pheonix Force. Zon taxed the ship's engines in a despirate attempt to reason with the godlike creature, who was bent on destroying planets that it no longer deemed worthy. While an amiable situation was eventually found, Zon saw nothing wrong with challenging such a force so much more powerful than he. Later, with T'mlik requesting he resume Science duties full-time, Zon began to search for a suitable replacement for First Officer. He believed he found one in Commander Colleen Fitzgerald, but soon after she arrived onboard, he discovered several disturbing things about her past. First, she was not of this native dimension, and secondly, she possessed paranormal, unexplainable sorcoress powers. Despite these revelations (which Zon was urged to keep secret), Zon kept her on as First Officer, as her shy but often emotional judgement proved to be a good contrast to T'mlik's stoic, logical nature. Zon, to this day, maintains a disbelief in the paranormal, citing a deep separation between the unexplained and the unexplainable. This belief has been strained since then, most notably when an actual vampire- an extra dimensional being of pure malice which possessed the body of a young man and fed only on blood -was captured and restrained while attacking an away team. Finding the man unfit for trial and entirely lacking in remourse, Zon was forced to admit to himself and to the crew that the creature they were dealing with was an actual monster of legend. While some, like Zon and T'mlik, saw this as merely another deadly occurance, no stranger than any other extra-dimensional being of pure malice which could possess others that Starfleet had encountered throughout the ears, some crew members became infatuated with the idea of a dangerous, mystical creature. Events transpired which led to the prisoner gaining free run of the ship and killing at least one crewmember before being killed. While Zon doesn't believe that there is such a thing as the supernatural, he does admit that there are things which can not entirely be explained by the laws of physics as humans can understand them today. Zon has also proven himself to be somewhat reckless, playing it fast and loose when it comes to diplomatic procedure. For example, Zon ordered the Explorer to travel to the planet Saroya in order to conduct First contact with the rapidly-changing totalitarian regime that had taken over the planet. However, this was a pretext in order to facilitate the transport of several refugees into Federation asylum, an act which was dangerously close to violating the Prime Directive itself. Throughout 2384, Zon began to show a number of psionic abnormalities, some similiar to that of a Newtype, others more subtle. Colleen Fitzgerald, due to her own wizarding heritage, began to wonder what exactly Zon was becoming. During the testing of the Ancient propulsion equations that Haweke Karbn had left on board, the Explorer was flung to the far reaches of the universe, to a realm where the differences between Thought and Reality were thin. Like the Enterprise before it, the ship had discovered a kind of edge of the universe, and the only way out was for Zon to convince the crew to control their thoughts. However, there was an oddly shaped Egg device that appeared of it's own will and began to stalk the Explorer, and the ship's unending curiosity caused the Egg to hatch. While it was Zon's own preturnatural concentration which forced the Egg-creature back into it's dormant state, Zon found himself calling upon a rift in space and time to transport the ship back to the Tatoo system. Following the discovery that the "Egg-Creature" was rippling through space and time destroying planets, Zon began a mad search to find and stop the creature's wave of death. Survivors of the planet Atari VII regard Zon and his ship as a death omen and have sworn vengeance on them both. While Starfleet found Zon not culpable of his actions given the peculiar situation surrounding the Egg, Zon found the death of an entire civilization and their blame being directed at his actions a heavy burdon to bare. When Edge Koenig declared himself Emperor and started on a mad, genocidal quest to destroy all life in the Galaxy, Zon was chosen to lead the Federation star fleet that was to meet Edge's forces in the Tatoo system. Zon was met with allied forces from all corners of the universe, including even enemies like the Peacekeepers, and was unanimously chosen to lead this multi-galactic task force. However, under the commencement of the attack, Edge transported Zon to the madman's Death Star and subjected him to possession by an ancient and powerful force known as Lord Atrolvon. Atrolvon was the last remnant of a long-forgotten race of beings who existed outside of linear time, and who many primitive races viewed as gods. Among this race, Atrolvon was the individual who was chosen, as a punishment, to become an avatar of destruction and renewal throughout the 'lower realms.' In a previous, alternate universe that Atrolvon had been imprisoned in, it was a very different Zon who had been destined to be the physical force of the Atrolvon force, and it was this Zon that had been strong enough to break Lord Atrolvon's cycle of destruction. Commander Colleen Fitzgerald, for the most part, led the fleet. Edge had counted on this universe's Zon being weak enough that Atrolvon would have full reign, but instead Zon broke through the brainwashing and forced Atrolvon out, where a mad-god psychotic vampire imprisoned Atrolvon in the Route of the Ages. Zon found himself confused, awash with memories and visions of places and worlds he had never been in. It was here that Zon discovered the secret of his peculiar abilities— along with some of the memories, Zon was able to access some abilities that the alternate version of himself had possessed. While Zon was content with merely being the observer to extranormal and fantastic events, he now found himself at the very center of them. These memories proved very effective when the Egg-Creature resurfaced, only to reveal to Zon that it was, or had something to do with an old, extra-dimensional force known as The Saint, which Zon could only vaguely recognize through the hazy and dim visions of a previous existance. In June of 2385 Zon and the Explorer returned from a long-range deep space mission, only to find that the Dread Conglomerate was in the midst of a civil war. Zon personally took the ship to the remains of Ace Kaelton's Shiva weapon, and reported back to Starfleet Command that the weapon was indeed capable of destroying an entire solar system. On their way back, the Explorer initiated first contact with the enigimatic Vorlon race. Zon has been instrumental in establishing a Vorlon embassy in Federation Space. Things worsened when Starfleet Intelligence reported that the Peacekeepers were planning a major offensive. It was Zon who decided to take a page from the Dominion War and mine off the Route of Ages, assuming that the Peacekeepers intended on dominating Federation space as well as the Tatoo System. This hunch proved correct, and the Peacekeepers made their intentions known and joined in the fight against the Dread Conglomerate. The initial civil war spread to a three, four, and eventually seven-fold battle, at the end of which Elusa Harkonnen would unveil her masterstroke and use a hidden droid army to pacify the remaining sides and force Starfleet, and others, out of the system. Zon's return would be even more devastating. With Elusa Harkonnen's forces destroyed by the Cylon fleet, the Cylon's retained martial law over the system. Zon took point and recieved permission to attempt a second, proper "First Contact" scenario with the Cylons. Knowing that they were linked through subspace to Vaana Retlyn, he had her brought along as an observer. While the situation was tense, Zon was able to open up a valid communication channel with the Cylons, and learn much about them. Ultimately, however, the event was disastrous, with Retlyn committing suicide in a misguided attempt to save the Explorer. In response, Zon led the Explorer against all twelve of the Cylon basestars. His stupendous victory, utilizing the Cylon's low-velocity missiles against them and overtaking them with the Picard Manouver, was given mixed reactions by his superiors. While the battle itself was consider successful, the mission to establish peaceful relations with the Cylons was considered a complete failure. After lending some assistance to Tatooine, Zon took the Explorer far off into the Outer Rim to follow the subspace transmission that both Retlyn and the Cylon basestars sent before they were destroyed. Zon hoped to find his wayward officer reborn, and with the help of Lucas Wolenczak, rescued the recently resurrected Vaana Retlyn from the aptly named Cylon Resurrection-Ship. Fortunately, the Explorer beamed a quantum torpedo into the belly of the ship, wiping out the Cylon control systems for the entire sector. Months later, the Explorer was ordered back to Tatooine to assist the Kukai Foundation in the strange cause of a small infant Wraith which was being harmed by some unknown assailant. During the investigation, a giant Wraith 'hyper-hive ship' approached the planet, and declared their intention to anihilate all life in the system unless the child was turned over to the Wraith. While these decidedly un-wraith like tactics piqued Zon's interest, it was ultimately a gamble which led to the revelation that the infant Wraith was in fact the Wraith Queen that had issued the ultimatum. Fixed against a temporal fleet made of Wraith hundreds of years more advanced than anything in the present, Zon ran an even more incredulous play: he utilized the temporal shielding that Lucas Wolenczak had jury rigged to duplicate the child's chroniton signature, and tricked the Wraith into following the Explorer through a slingshot manouver into the timestream. Sacrificing himself and his ship to change the timestream, Zon left the infant in the care of Lucas, hoping that he would give the child back to her adopted family. As of Stardate 62569.7 (July 2385), the Explorer was declared MIA. It returned months later, having visited a strange, and vicious future where humanity had been anihilated by the Shadows. Pledging to stop this war before it began, and with the help of a time-displaced Angel Daiko, Zon brought back a fantastically advanced space station from a thousand years into the future, under the advice of several time-lost forces. This station is currently being studied by Starfleet, as well as checking into the validity of the Captain's temporal trip. Following his rather unique service to the Federation, Zon was taken out of the command of the Explorer and transferred to act as Starfleet attache and Federation Ambassador to the Kukai Foundation. This change of pace was jarring at first, and Zon often felt useless, more of a simple paper-pusher to the Starfleet Corps of Engineers who were assisting the Foundation. While he missed the excitement on the frontier, exploring strange and new worlds, he understood that the Explorer was a ship that belonged out in the far reaches of uncharted space, not tethered to a space station. While his particular skillset as a captain, in particular his brashness and initiative, served him well onboard a starship, when acting as an attache and, at best, an advisor, it proved to do little but grate the locals. During combat situations, protocol indicated that Zon should remain in his office; so Zon aqquired permission to transfer his office to the Foundation flagship Durandal, as to allow him to board the bridge of the ship at his own discretion, where he felt most comfortable. However, Zon's time traveling adventures would come back to haunt him, as his efforts to change the future led to a new threat- -the Peacekeepers. With Angel Daiko rescued from the Shadows (an event which did not happen in the previous timeline), the young girl was unfortunately possessed by an ancient, malevolent force from another dimension, just before she was due to enter Starfleet Academy. Now under the title of "Angela," the Witch brutally crushed Tatooine and conquered most of the solar system, while having her Peacekeeper lackies block all subspace communications to the Lunix colonies. Without any hope of rescue, Zon confronted the magnificently powerful witch himself, only to be sent teleporting back to Earth, in a cavern with a Shadow ship. 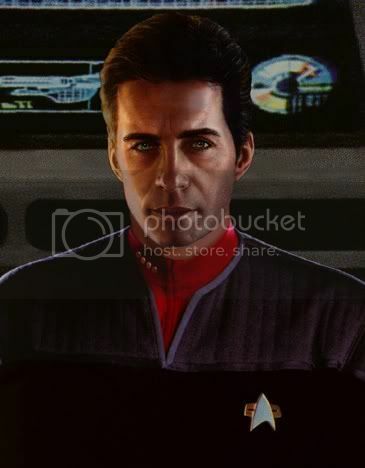 It would be a month before Starfleet Command would allow him to return to the Tatoo system, where he would join in the fight against the Peacekeeper forces, eventually forcing them out with the assistance of Captain James Blackwell of the U.S.S. Agamemnon. However, with Blackwell KIA during the fighting, Starfleet has recognized the danger inherent in setting up a fleet position in the Tatoo system, and has temporarily reassigned the Agamemnon under Zon's command, to use at his discretion in defense of their allies on the Kukai Foundation. Zon had no extended family members that he kept in constant touch with, as his life on the frontier, as a starship Captain, kept him rather busy. Still, he regarded himself as something of a wayward father figure to Lucas Wolenczak. Telana Daiko was known to refer to him as her Uncle Zon. Zon tried to keep up with the friendships that were forged during the Dominion War. T'mlik and Doctor Cassandra Nance have both known him since the academy, and Zon remained in touch with fellow Captains like James Blackwell and Ducem Karr. Zon was also friends with Buzz Argonon, one-time proprietor of The Cantina, which gave Zon a shock when he first arrived in the SW-1311 Galaxy. Zon was a known affectionado of martial combat, having trained in various different deciplines throughout his career. He enjoyed sparring with Cassan Fistwick while the Jedi was stationed onboard the Explorer. However, he was particularly talented in the realm of starship tactics. While he first demonstrated his affinity for starship combat during the Dominion War, his mettel was ultimately tested while outnumbered in his first encounter with the Goa'uld. His quick thinking and affinity for unconventional tactics proved to be his strength, eventually culminating in his epic victory over the Cylons, facing down twelve fully armed basestars and defeating them singlehandedly. During the battle against Koenig's New Empire, Zon was unanimously chosen to lead the combined fleet, suggesting that even the Peacekeepers regarded him as a capable tactician. Due to his encounter with Atrolvon, Zon has access to the memories of pre-reset Zon, though he has no conscious control over them. Having always played his hunches, he merely found his hunches becoming more and more correct.